Doors cannot accidentally jump the track. Wheels never need lubrication. Doors can be hung or removed without detaching hangers. 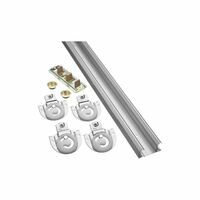 Door guide provides smooth operation and allows up or down adjustment of doors. Dial-action hanger allows easy vertical adjustment. Safe working load: 60 lbs. 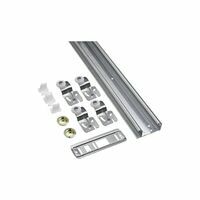 For doors 3/4" or 1-3/8" thick, weighing up to 50 pounds. Track can be cut down to fit any smaller openings. Set contents: (1) 2200 track length, (2) 2238 hangers, (2) 2216 hangers, (1) 2135 door guide and (2) 15 pulls.